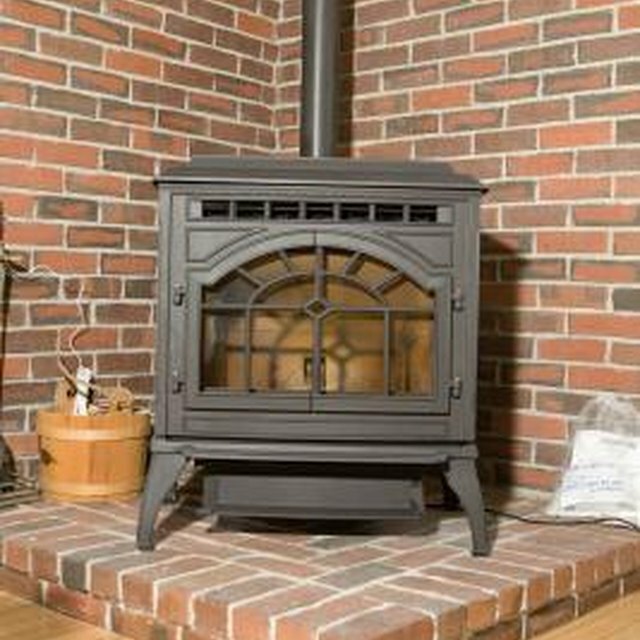 One of the primary concerns when putting a wood-burning stove in your home is where to vent the appliance. Professionals recommend placing the chimney or stovepipe on an inside wall to aid in combustion. Furthermore, installing the stovepipe on an interior wall leads to an increased draft that eliminates a multitude of problems with wood-fired stoves. Although putting a wood stove on an interior wall works best for a number of reasons, you can vent the stove to an outside wall if the interior option is not possible. For best results, vent wood stoves through an interior wall. Chimneys or stovepipes for wood-burning stoves or fireplaces work on the principle that the hotter the pipe or chimney, the more draft delivered to the fire. Properly installed venting mechanisms prevent back draft by supplying the suction, or draft, that keeps the smoke from entering your home. A chimney basically acts like a gear-driven machine – heat makes draft, draft brings in air for combustion, combustion makes the fire burn hotter, a hotter fire creates more draft, and the process begins again. Additionally, a properly insulated stovepipe or chimney keeps exhaust gases hot until they are expelled into the atmosphere, thereby making more draft with less heat and conserving fuel in the process. As the warm air rises inside your home, it produces low pressure in the lower areas of your house and high pressure in your home’s upper regions. This phenomenon is known as the stack effect, which describes a neutral pressure plane created when the pressure in your house equals the pressure in the outdoor atmosphere. If you install your chimney or stovepipe in the center of your home, it defeats the stack effect, because the chimney stays as warm as the house but, if installed according to code, is taller than your home. Because a wood stove vented through an interior wall produces a more efficient fire by defeating the stack effect, it warms a home with less wood and eliminates cold-stack issues. If you choose to vent your wood-burning stove to an outside wall, you might experience back drafts and unpleasant odors. These happen primarily because the draft created by the chimney is less, or colder than, the stack effect created in the house by the warm-air-rising principle. Because a stovepipe or chimney on an outside wall cannot eliminate the stack effect, placing your stove there can also result in a cold hearth and a less efficient wood-burning appliance. If you have no other alternative than to vent to an outside wall, make sure your stovepipe or chimney is well insulated to combat the lack of warm air surrounding your exhaust vent and the problems associated with it. If your only means of venting is through an outside wall, you may wish to choose a wood pellet stove as an alternative to a wood-burning appliance. Wood pellet stoves operate by burning pellets made of sawdust that are fed to the burning chamber through a hopper. In most models, an automatic lighter lights the fuel, which in turn heats the stove and eventually the house. Pellet stoves require a fresh air intake vent and an exhaust vent. Both are ventilated directly to the outside, thus eliminating the need for a stovepipe or chimney for operation.